Click CREATE PROJECT to view the page that shows options for creating a project. Note: For quick access to the CREATE PROJECT button, on the top navigation bar, position your pointer over . From the options page, select DUPLICATE PROJECT – this action opens the Duplicate Project form. 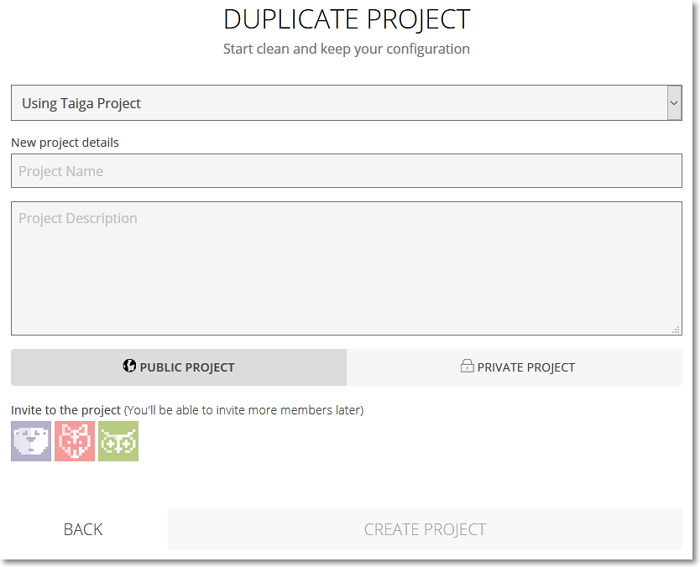 On the Duplicate Project form, select one of your existing projects you want to duplicate. Enter a Name and a Description for your new project – these are mandatory in order to enable the CREATE PROJECT button. (Optional) Select whether you want to create a PUBLIC PROJECT or a PRIVATE PROJECT. Note: Taiga provides free hosting for unlimited public projects and for one private project. To learn more about the fees for hosting several private projects you can go here. Choose which members of the project you are duplicating you want to invite to the new project. To remove a member from the invite list, click that member’s avatar (hover over an avatar to view that member’s username). 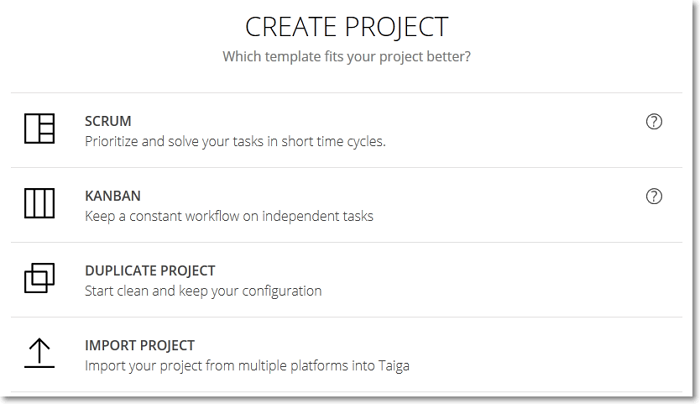 Click CREATE PROJECT – this action automatically adds your new project to the projects list and takes you to the new project’s TIMELINE. No User Stories, Tasks or Epics are duplicated.